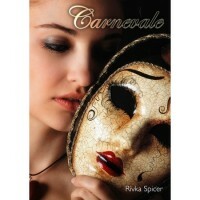 Carnevale is the second in a series, Masquerade is book #1. Carnevale starts off a while after masquerade ended, and we meet Oceana again. She has had the baby and is living with one of Tristan's old pets and having her help with the care of the baby, and everything is working as Oceana would want for now. She is away from the vampires and their world after losing Tristan.Then things start to get interesting for her, and she is suddenly thrust back in to their society and it does not sit well with her at all. She is the leader of their house, and she is hesitant to take on that roll, she never asked for it, never wanted it, Tristan made her the leader and she is still a little angry with him about that. There is so much that goes on in this book, and Oceana learns a lot about what Tristan has done behind her back, and she struggles with her love for him and her feelings of betrayal. She also becomes increasingly aware of the mutual feelings that she has with Will, and they are trying to decide what to do about that. In amongst all of this, there is a great threat to their house, and we get to see all of the great characters that we loved in masquerade come back, and I was extremely happy to see that, I love all their different personalities. We are also introduced to some new characters that are quite colourful as well, and the story line takes a twist that it really exciting and I could not read fast enough, and I really wish that I had someone to talk to about it, but I cannot put it on here and spoil it for you guys.If you love vampire stories with a bit of a twist, this series is the one for you! I guarantee you will love it just as much as I do, and I cannot wait for the 3rd book to come out, I need to know where this series goes! 5/5 please go read it!